Hello! Hope you have been having a wonderful week so far! 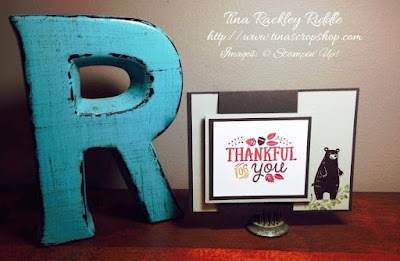 October's D's Stamping Team USA Blog Hop is all about Giving Thanks. I hope you'll stop by everyone's blog to check out the inspiration! 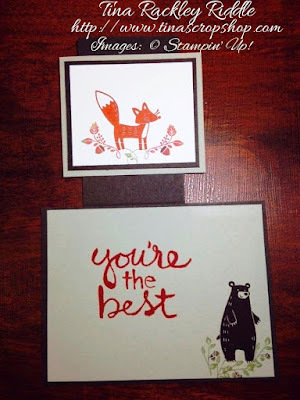 If you've already been hopping you should have landed here from Deb Naylor's fabulous blog! Deb was kind enough to join us this month as a guest hopper and we are so excited to have her! I just love the bear in this set. He's so stinkin' cute! For the sentiment, I used sponge daubers to add Cajun Craze, Chocolate Chip, Old Olive, and Hello Honey ink to my stamp. The next best thing to that super cute bear is that precious fox! lol For my sentiment on the inside of the card I used the Watercolor Words stamp set. I really love the boldness of these sentiments! Thanks so much for stopping by! Please make sure to click the Next button and hop over to my friend, Megan Thompson's blog! I love the bear stamp, Tina! What a cute card! Thanks Sue! :) I love that bear too! Awe, really cute! I haven't done a flap card. Love the layout....cute stamp set too...now I think I need it! Thanks Tina! Lol. Thanks Deb! I think you need it too! Such a fun card Tina!! I love the bear as well! What a clever fold! I will be using that in a class soon! Thanks for sharing!